Reversing momentum: "dead time" or useful tactic? In my recent article "How the internal arts work: Part 1" I discussed the issue of "dead time" - ie. time which is not productive or efficient in relation to achieving your desired outcome. Some of the comments made in relation to that article raised the issue of whether "reversal of momentum" is a subset of "dead time". I believe that there are many instances where reversal of momentum is far from "dead time". This is true of both unarmed and armed fighting. In fact, as I will detail in a forthcoming article, taijiquan makes extensive use of this tactic. However my recent immersion in the study of traditional Chinese swordplay, including the long military saber most recently known as the miao dao 苗刀 (used by the Chinese military in the Second Sino-Japanese War), has provided at least one other concrete example of why it is sometimes necessary (and useful) to reverse your momentum. to reload for another strike (eg. when your momentum along a particular tangent is exhausted or no longer relevant). In either case, you'll notice that "reversal of momentum" is really about the necessary contraction of your momentum after a full extension or expansion. It is a resetting or reloading analogous to the withdrawal of a wave that has just crashed onto the shore. Yes, retracting your momentum can give your opponent time to strike you; after all, you are not exerting force on your opponent during the withdrawal (at least, not usually1). However the human body is not built like a bowling ball; it can't keep pressing forward indefinitely. At some point you have to reset or reload. This is particularly true when you are facing a resistant opponent whose raison d'etre is as much to thwart your attacks (by evading, deflecting or stifling them) as much as it is to attack you. It is this issue (one that I hold to be a fundamental truism) which reflects my long-standing skepticism of "attack string" training methodology. Unless you're fighting a dummy or other inanimate body (or at the very least, a terribly inept opponent) a strung-together sequence of dozens of blows is not going to reflect how things pan out - not even remotely. So some resetting or reloading is going to be necessary. But how much is "necessary"? Regular readers of my blog will be more than familiar with my calls for this to happen as economically and with as much contextual appropriateness as possible. It is for this reason that I have argued strenuously against hip pre-loading in kata (forms) and bunkai (applications). A pre-load or reload takes time - and telegraphs your intention. On the other hand, unless you want to pepper your opponent with ineffectual prods, some form of loading is warranted. Normally one side of your body will naturally load as the other side strikes. This is the essence of the much-maligned traditional "chamber" in punching etc. A video in which I demonstrate contextual loading of hips and arms on one side while the other is striking. However it is not always the case that you can load one side while the other strikes - eg. when using a 2-handed weapon. In those circumstances one can still minimize the time taken to reload by making it part of one continuous flowing sequence. To illustrate my point in this regard I find it useful to take longer weapons as an example since they amplify the issues and make them more apparent. Master Tsou demonstrates xie kan (diagonal cutting) with the mia dao. See in particular from 0:26 onwards where he utilizes a circular wind-up to create a single, continuous movement out of the load and strike. Accordingly, consider the above video and the adjacent pictures of Master Tsou, a practitioner and teacher of the miao dao. Here he is performing one of the basics of that weapon, namely "xie kan" (斜砍 - a diagonal downward cut). 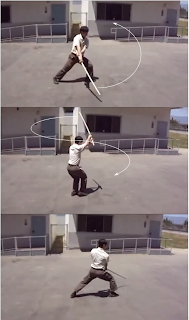 In the first picture you'll note that he starts to raise the sword: this not only reloads for another downward cut, but also serves as a rising, "beating back" deflection called "beng tiao" (崩挑). Having raised the sword, he might simply choose to reverse his momentum and perform another downward cut on the same angle as he started. However Master Tsou instead demonstrates a downward cut to the other side, taking advantage of the continuous circular movement both to minimize the loading time and increase the speed (and hence force) of his next cut. However it is not true to say that such a circular movement will be appropriate in every instance. There are some times where a simple straight reversal is required. For example, consider another leading Chinese sword practitioner, Scott Rodell, performing the sequence depicted on the left. Mr Rodell initiates the sequence by performing a downward cut to beat down his partner's sword. 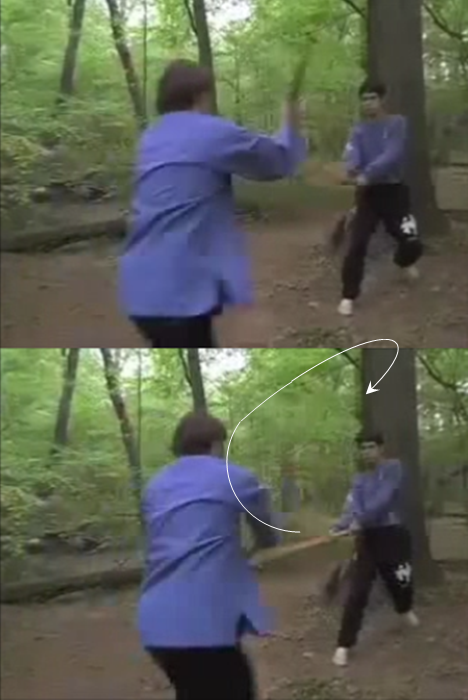 His partner reacts by converting the downward momentum into a curve that takes his sword around and over his head so as to effect his own downward cut. So far so good: this is entirely consistent with Master Tsou's example of the xie kan basic (ie. Mr Rodell's partner is creating one continuous flow of movement out of the downward moment and his own subsequent counter). But what happens next is most interesting: As Mr Rodell's partner swings his counter into action, Mr Rodell responds to it with a straight reversal of his own sword's momentum - ie. a retraction more or less along the same line as his initial downward cut. This retraction is the "beng tiao" to which I have previously referred and it enables Mr Rodell to deflect his partner's attack by beating backwards. Mr Rodell then reverses his momentum again with another downward "kan" (砍) attacking his partner's wrist/forearm. In this instance the reversal of momentum (both for the beng tiao deflection and the kan counter) constitute the shortest line of movement; it would not be more economical to create any larger circular action, even if it creates one movement out of two and even if it would effect a more "powerful" cut. In other words, the beng tiao and kan response creates the shortest, most economical response to the attack effected by Mr Rodell's partner. Because of the sharpness of the blade, there is no need for any greater force than that made available through the simple reversal. The fact that this attack was deliberately prompted in this sequence speaks volumes: the beng tiao and kan response is not a compromise option; it is not a desperate, last-second tactic. Rather, it is a considered, deliberate tactic from the Chinese military long sword fighting method. Scott Rodell demonstrates Beng Tiao and Kan - two basics of the Chinese long sword (set to start at 5:07). The act of reversing momentum is often regarded as a highly defensive, reactive tactic. It seems the very opposite of what you would expect from military instruction. it is done as economically and quickly as possible (in particular, without any unnecessary pause in movement). It is these principles that underlie taijiquan's use of reversal of momentum - a subject I hope to address in the very near future. 1. Not every retraction is defensive. Rather a backward movement of the body can, in some cases, power a forward thrust of the hand almost as effectively as forward movement of the body can - particularly when the hand is holding a sharp blade (making greater force unnecessary). In the end, you want to effect a very simple result; sufficient momentum under the formula p = mv. In other words, you want your mass moving as fast as possible in the available circumstances. 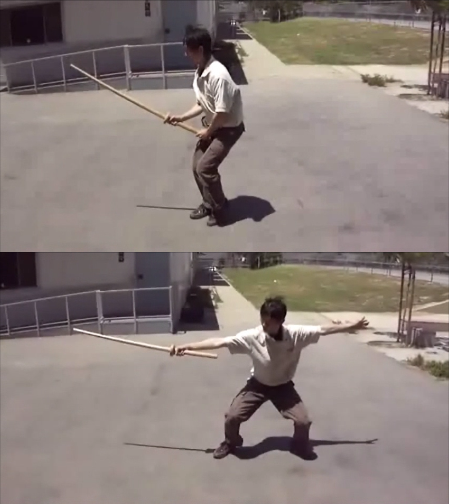 Taking the miao dao sword as an example, note Master Tsou's basic technique of a short energy thrust ("dian" 點) - as illustrated in the adjacent images and in the video below. It is true that a forward movement of the body can add momentum to a sword thrust. However for someone charging at you, the outward thrust of your arm counterbalanced by the backward movement of your body can still give your sword sufficient momentum to cause your attacker to be impaled on it. Master Tsou demonstrates "Basic No. 7" (a "dian" or short energy thrust) using his reversed momentum to power the thrust. I think that the issue with reversal of momentum is that people associate the moment of stillness with a lack of energy. The important point from the internal arts is that when you reverse momentum, it's an elastic movement - there's never a moment where you're actually "dead". Even at the moment of fullest extension, where you are necessarily still for a split second, you still have potential energy stored in the elasticity of your muscles and connective tissues, so you don't have to expend additional energy to regenerate the momentum in the other direction. Great article, keep them coming! Something that's often disregarded, yet should be in every one arsenal for those times it is essential. Have been working on reversing momentum to recycle it forwards recently. It's very hard and is doing my head in. One of the basic Shinkendo two man drills uses a version of that. This is for a jodan straight down slash that is perhaps too powerful to fully block. A high block is utilized that lets the attack slide off, using the momentum from the sword being depressed, the defender places the sword immediately into jodan and slashes down at the attacker before he can recover from the momentum of his downward cutting katana. For lighter swords that can react faster or less powerful/committed attacks, this would simply stop the attacker's sword, and based upon feel, something else might be called for. Such as the additional block you see used in the video, and then having opened up the center line, a straight thrust or linear strike will open up the vitals. Because the katana has one blunt side plus the the flat parts, I've thought about using my other hand on the middle or upper 3rd of the blade when blocking and thrusting. At times when my arm is too tired to make a proper swing or deflection, I can easily see myself resorting to such things. And using a katana more like a bo. I also saw some kenjutsu users in Japan use a version of this to block gravity assisted cuts. I'm not sure what style it was called though. The movements were smooth and flowing, like bo. It also helps when improving the accuracy for thrusting if my wrist becomes tired. All kinds of things to try in swordmanship. When I first read the various accounts that said a sword is a part of a sword user's body, I wasn't too sure what they meant. But now that I can visualize where the blade will go, without looking at it, sort of like how I can visualize my finger vis a vis the position of my eye so I don't poke my eye out, it makes a lot more sense. I tried to continue the momentum when we were playing around with foam sticks as swords, but it didn't work. The foam had some kind of air drag that prevented me from going from block to attack very quickly, and the attacker could too easily stop the swing just with muscles. The Japanese jodan high tate is probably one of the preferred methods for kenjutsu users given the gravity assisted power and speed. But at the same time, this power and speed can often make it vulnerable to internal concepts such as power stealing. Where the defender's sword steals the power from the attacking jodan sword and uses it to boost a counter-attack beyond the abilities of the attacker to guard against. Why bother with stepping in stances?